The glossopharyngeal nerve (cranial nerve IX) serves many distinct functions, including providing sensory innervation to various head and neck structures. The glossopharyngeal nerve (cranial nerve IX) is responsible for swallowing and the gag reflex, along with other functions. The glossopharyngeal nerve receives input from the general and special sensory fibers in the back of the throat. The glossopharyngeal nerve has five components: branchial motor, visceral motor, visceral sensory, general sensory, and special sensory components. otic ganglion: A small parasympathetic ganglion located immediately below the foramen ovale in the infratemporal fossa that is associated with the glossopharyngeal nerve. medulla: The lower half of the brainstem that contains the cardiac, respiratory, vomiting, and vasomotor centers and is associated with autonomic, involuntary functions such as breathing, heart rate, and blood pressure. stylopharyngeus muscle: A muscle in the head that stretches between the temporal styloid process and the pharynx. The glossopharyngeal nerve is the ninth of 12 pairs of cranial nerves. It exits the brainstem out from the sides of the upper medulla, just rostral (closer to the nose) to the vagus nerve. 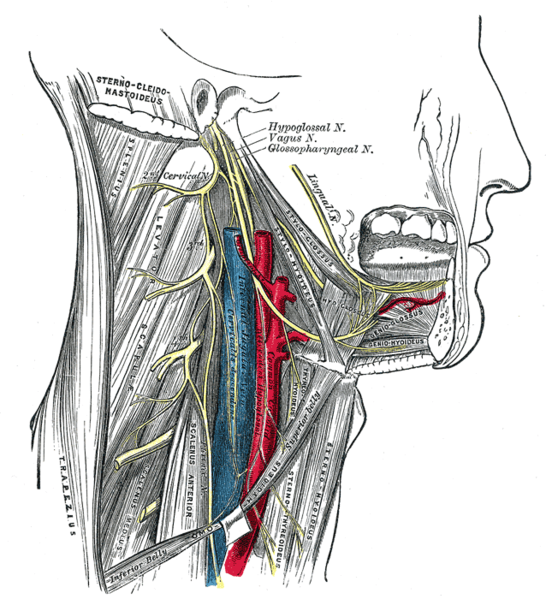 Glossopharyngeal nerve: Image of head structures including the glossopharyngeal nerve. The motor division of the glossopharyngeal nerve is derived from the basal plate of the embryonic medulla oblongata, while the sensory division originates from the cranial neural crest. There are a number of functions of the glossopharyngeal nerve. It controls muscles in the oral cavity and upper throat, as well as part of the sense of taste and the production of saliva. It receives general sensory fibers (ventral trigeminothalamic tract) from the tonsils, the pharynx, the middle ear, and the posterior 1/3 of the tongue. It receives special sensory fibers (taste) from the posterior 1/3 of the tongue. It receives visceral sensory fibers from the carotid bodies, carotid sinus. It supplies parasympathetic fibers to the parotid gland via the otic ganglion. It supplies motor fibers to the stylopharyngeus muscle. It contributes to the pharyngeal plexus. Branchial motor (special visceral efferent): Supplies the stylopharyngeus muscle. Visceral motor (general visceral efferent): Provides parasympathetic innervation of the parotid gland. Visceral sensory (general visceral afferent): Carries visceral sensory information from the carotid sinus and body. General sensory (general somatic afferent): Provides general sensory information from the skin of the external ear, internal surface of the tympanic membrane, upper pharynx, and the posterior 1/3 of the tongue. Special sensory (special afferent): Provides taste sensation from the posterior 1/3 of the tongue.